Kybella is the first and only FDA approved nonsurgical treatment that permanently diminishes fat under the neck and chin. It is a synthetic form of deoxycholic acid, which is a naturally occurring substance that helps to break down and absorb fat in our bodies. When injected, Kybella causes the destruction of fat cells, preventing the storage or accumulation of fat within the treated area. Kybella® is a minimally invasive treatment that allows for contouring of the jawline and provides a more youthful appearance. +What causes submental fat (or a double chin)? Submental fullness is a common condition that affects both male and female adults, and is caused by aging, genetics, and weight gain. Even young patients can have a double chin if they are genetically predisposed. Submental fullness is often resistant to diet and exercise, making it particularly difficult for patients to remedy on their own. As we age and gain weight, the double chin gets heavier and makes us look older. Yes! Kybella has been extensively studied and tested for treatment of the double chin. It is FDA-approved and extremely safe for the treatment of submental fat by qualified dermatologists trained to perform this procedure. To ensure patient safety, Kybella is only available to physicians who have undergone a special training program to learn about recommended techniques, proper dosages, and appropriate uses. 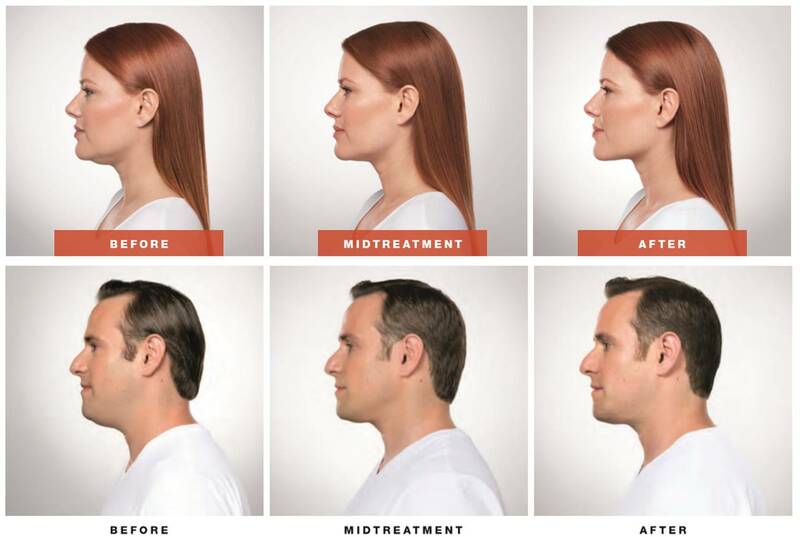 +Can Kybella® be used in other places besides the chin? Kybella is currently indicated only for treating excess fat under the chin. The safety and results of using Kybella elsewhere have not been fully explored and is not recommended at this time. +Who should not be treated with Kybella®? • If you are pregnant, planning to become pregnant, or breastfeeding. • If you have severe skin laxity of the neck, you may be a better candidate for a traditional surgical neck lift. • If you have a history of difficulty swallowing. • If you have a history of bleeding abnormalities. +When will I see results? Visible changes are generally noted within 4-6 weeks of a treatment, and continued improvement is seen with additional treatment sessions. +How many Kybella® treatment sessions will I need? It varies from patient to patient – most patients require between 2-4 treatments, which are performed 4-8 weeks apart. We will coordinate a treatment plan based on your unique anatomy and aesthetic goals. +Are the results of Kybella® permanent? In short, yes. Once the double chin is treated, as long as you do not gain weight in that area, the treatment is essentially permanent and retreatment is generally not required. However, a small amount of fat is left behind in the treated area, and if you gain a large amount of weight, the remaining fat cells may expand. Additionally, normal aging changes in the skin and other tissues of the neck will continue to occur and issues of skin sagging in the jowl and neck area may develop separately. +What is a Kybella® treatment like and what can I expect at my appointment? Dr. Bhatnagar will examine your chin and determine if you are an appropriate candidate for Kybella®. If so, a customized treatment plan will be determined and explained. 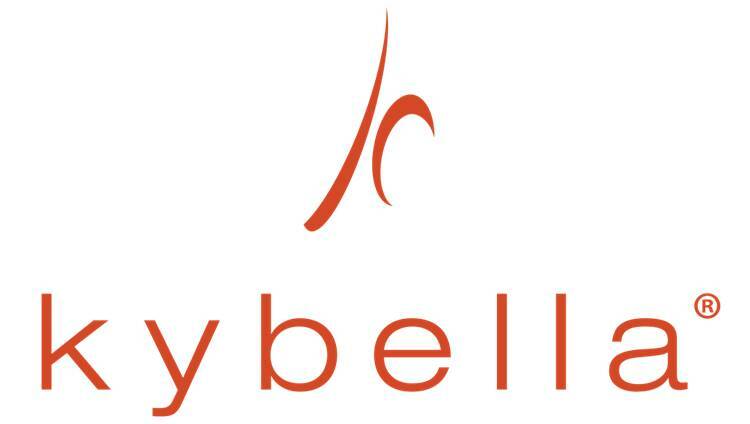 Kybella® is administered by injections into the fat cells under the chin. Each patient is different so the number of injection sites will vary depending on the size of your submental fat, but can range from 15-50 sites. Each treatment typically takes about 15-30 minutes. There may be mild to moderate discomfort during the injections. Prior to treatment, ice or a topical numbing cream may be used to numb the treatment area. +What are the side effects of Kybella®? All patients should expect immediate swelling in the treated area, which is most dramatic in the first 3 days after your first treatment since the most fat is dissolved during the first session. Swelling will steadily decrease, but may still be apparent up to 1 month post-treatment. Subsequent treatments are associated with milder swelling. Tenderness and numbness in the treated area is very common and can last weeks. Redness and firmness is also common. Bruising may occur, but generally resolves within 1 week. Rarely, Kybella can cause more serious but temporary side effects, including trouble swallowing and nerve injury in the jaw that can lead to an uneven smile or facial muscle weakness. +How shall I prepare for my Kybella® treatment? • If you are taking over the counter agents that can increase bruising such as Advil (ibuprofen), Aleve (naproxen), aspirin, fish oil supplements, or vitamin E, please ask your primary care doctor about stopping these one week before the procedure to help minimize the risk of bruising. If these medications are medically necessary, please continue them. Do not stop your Coumadin or Plavix. Do not stop aspirin without consulting with your primary care doctor. • Take 1g of Tylenol 30 minutes prior to your injection. • If possible, plan your procedure so you can have 3-4 days before returning to work or important social engagements. +What do I need to do AFTER my Kybella® treatment? • You will experience swelling and redness of the treated areas for 24-48 hours which can be managed with cold compresses (up to 20 minutes/hour). If using ice or ice packs, be sure to cover with a fabric or napkin to avoid direct contact with the skin. Icing too vigorously can cause frostbite and scarring. Using an extra pillow at night helps to decrease swelling. • You will likely experience mild bruising and numbness of the treated areas, which typically lasts ~5 days but may persist for up to 2 weeks. • Do NOT scratch, massage, or traumatize the treated areas in any way. • You may wear a scarf to camoflauge any swelling or bruising. • Please contact the office if you develop any difficulty swallowing, crusting, scabbing, or asymmetry of your smile. If you are interested in Kybella®, Contact Us today or call 732-739-3223 to schedule a consultation with Dr. Divya Bhatnagar. Together, we can discuss your concerns, determine if Kybella® is the right option for you, and design a treatment plan that will help you say goodbye to your double chin—for good!